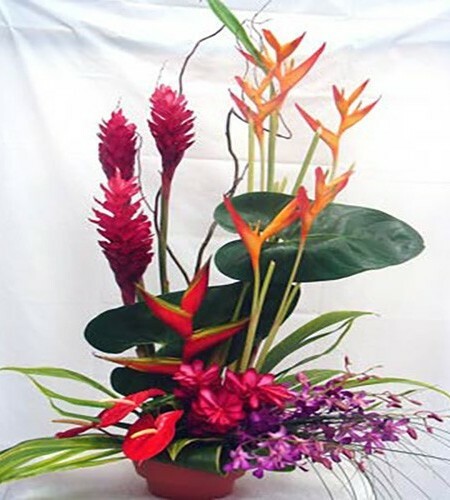 We work with local florists to offer you a wide selection of arrangements. You can easily find one to fit your budget. Not sure what flowers to choose? Look over our helpful Hawaiian flower guide for names and descriptions of the most popular Hawaiian flowers. We will do our best to use the exact flowers shown. But in some cases demand or weather can leave some flowers in low supply. In that case we will still complete your selection with a compatible choice. 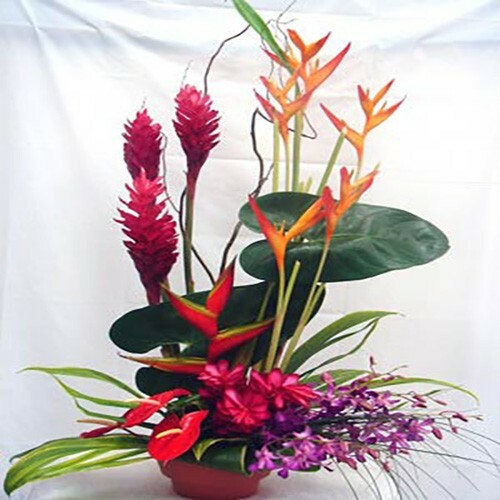 If you need centerpieces for a Hawaiian wedding or other event please let us know in advance. We provide leis and loose orchid blooms for Hawaiian weddings and other occasions. If you prefer a Hawaiian gift basket we offer free delivery to Waikiki hotels. 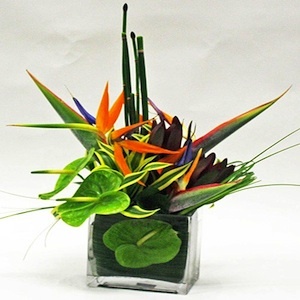 Flower delivery in Honolulu is now available through our association with local flower shops. The selections are shown below. Unlike our farm direct flowers stems these arrive already arranged in a container. They are ready to display. We mix in greenery and baby’s breath for a remarkable, balanced display. Please order in advance. We can often deliver same day if your order is received by noon Hawaii time. Choose your delivery date at checkout. Let us know whether to deliver as soon as possible thereafter if that day cannot be met. Order 3 days in advance to request a specific time in our comments section. Otherwise delivery time will be at our discretion. No Sunday deliveries. Saturday deliveries may be limited by area and time. Delivery is for Oahu only. Not available for mainland or outer island addresses. Orders for those invalid areas will be cancelled and may incur a cancellation fee. Holidays are busy. Last minute orders may not be filled. Please order early. We will do our best to deliver the exact assortment shown. However, we may substitute a comparable stem if certain flowers are not available. We will make one attempt to deliver. If the recipient or other agent is not available we will leave a note with instructions for pickup. Redelivery will result in an additional charge. Hotel deliveries are to the front desk or bell desk to take to the guest room. Gratuity is not included. If there is a problem with your delivery please let us know that day.